Of the 3 primary game species we target, Lac Seul’s large and abundant walleye get the lions’ share of the press. But we also have excellent seasonal opportunities to chase big Pike and smallmouth bass as well. In particular, the bass population has exploded over the past decade for both size and numbers. With consistently strong numbers for both volume and size, walleye are the number one target for our guests throughout the seasons. Anglers return year after year not only for the chance at a 28 – 32 in. trophy, but also for the surprisingly large number of 20 – 25 in. 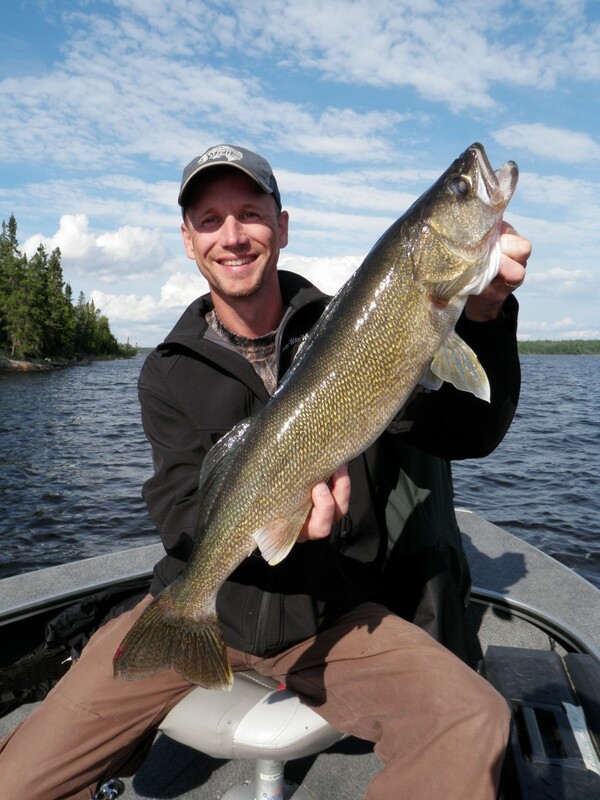 walleye caught every day on Lac Seul. Locations, patterns, and preferred presentations shift dramatically through the course of the changing seasons, but the guides work together to stay on top of the trends. They also make sure that there are always some nice eaters in the ice chest for shorelunch every day. Many of our guests prefer to walleye fish with jigs. Using different sizes and fished at different speeds, jigs are very effective for walleye throughout the entire fishing season. At the same time, the guide crew has been and will continue to be very aggressive trying different presentations and fishing styles as conditions change. Bottom Bouncers and spinner rigs, Husky Jerks, diving crankbaits, plastics, and Gulp Alive have all been extremely productive at different times over the years. Small-to-medium-sized pike can be caught in numbers throughout the season and recently we have been seeing more big ones in summer, but the majority of the targeted Giant pike that are boated every year are caught during the first and last 3 weeks of the season. Cooler water is the key factor moving these big fish into shallower water more accessible to standard Pike fishing gear. We know that many of these bigger pike utilize the deeper sections of the main lake basins during most of the summer months. We could target these fish using deep water trolling techniques, but that just really isn’t much fun. On top of that, it is difficult to spend too much time chasing long shots when big summer walleye are predictable and hungry. 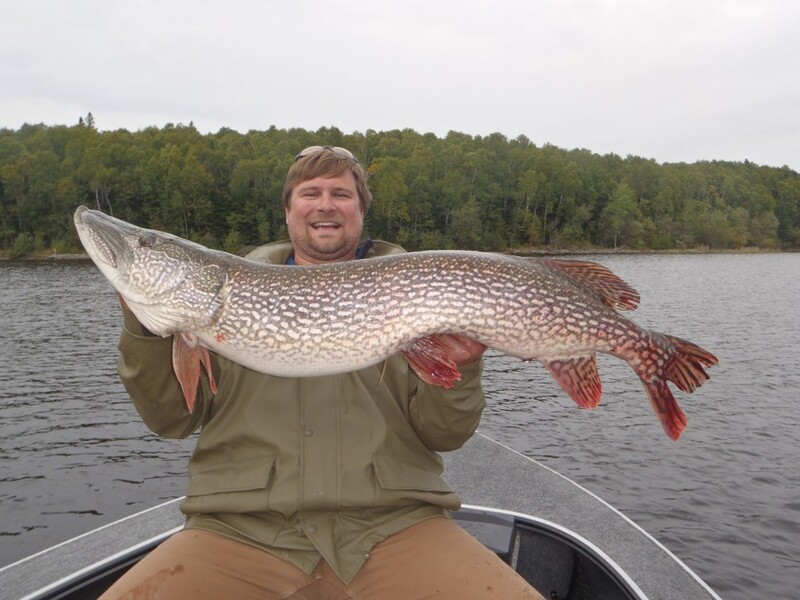 The reward for anglers that put the time and effort in to chasing big gators at peak times, is that Lac Seul pike tend to be extremely well fed and are often much wider and deeper bodied fish than your average Canadian shield pike. We have caught and released standard looking 40 inch plus pike, but we have also seen unbelievably fat 43 – 46 in. fish that weighed 25 to nearly 30 lbs. Spoons, spinner baits, in line spinners, and big Plugs can all be effective turning big Pike, but the majority of really big fish caught recently have been on Husky Jerks, large crankbaits, Jerk baits, in line spinners, and big spoons. Over the past 10 years we have seen a consistent increase in the size and numbers of smallmouth bass being caught each year. In the south central main lake basins around Silver Water Wheel Lodge, there is a relatively much smaller amount of shallow water rock rubble shoreline than there is deep open water. As bass seek out preferred spring and spawning locations, we find large numbers of adult bass concentrating in these areas from late May to early July. June is definitely our peak month for bass production. After the spawn, as water temps increase, they move to deeper water of the main lake basin and scatter. We will still catch the occasional stray while walleye fishing, but there is no comparison to June. One of the most striking aspects of our local bass fishery is the surprisingly low numbers of smaller bass present. On the best spots, you are much more likely to catch a 17 in. bass than a 12 in. bass. We believe that many of these big bass grew up elsewhere and migrated to find the “best” spring habitat. Competition is fierce for limited turf space and the result is that to control the best bass territory you have to be big. In recent years we have seen more and more June guide sheets reporting 20, 30, even 40 plus bass between 17 – 19+ inches in a single day. 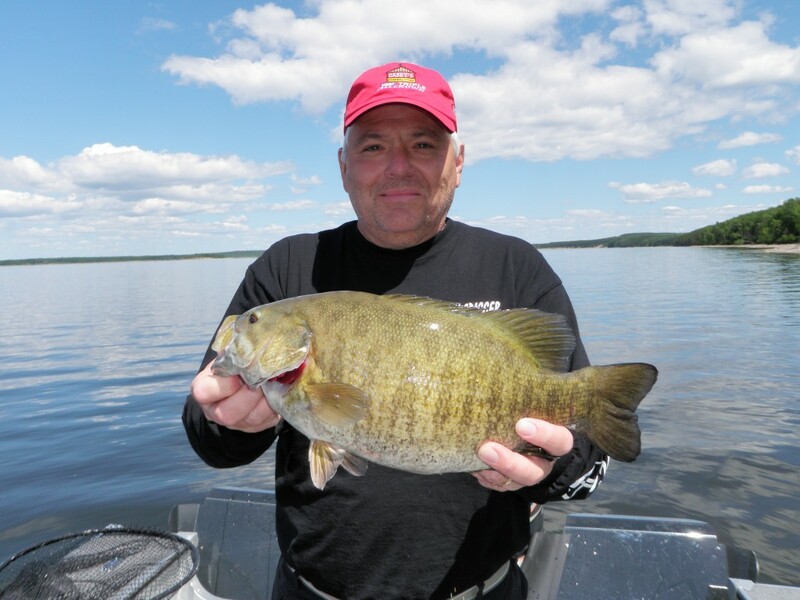 All of the standard smallmouth presentations have proven effective at different times, though we have seen distinct preferences for one over another with changing conditions. An assortment of smaller jigs and twisters, small crankbaits, spinner baits, rattle traps, top water plugs, tubes, and plastics will cover most of the different options throughout the season.